Summit County, in north-central Colorado is bounded on the west by the crest of the Gore Range, on the northeast by the crest of the Williams River Mountains, and on the southeast by the FrontRange. Summit County ranks first in Colorado in placer gold production and tenth in the State in total gold production. 1,010,670 ounces of gold has been produced through 1959. Mineralization in the Breckenridge area consists of both placer deposits and primary lode deposits. 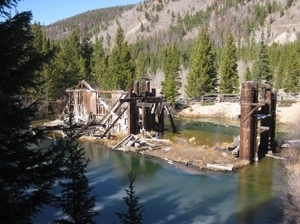 The placer deposits near Breckenridge were some of the richest in Colorado. Virtually every creek bed and dry gulch in the area contained gold. A few of them (like French Gulch, Illinois Gulch, and Georgia Gulch) were legendary producers. Lode deposits consisting of gold and silver-bearing polymetallic sulfide veins are also found in the Breckenridge District. By far, the most important of these occur on Farncomb Hill. On the western side of the hill, veins containing native gold, pyrite, chalcopyrite, and galena are hosted within a Laramide quartz monzonite intrusion. On the southern side of the hill, the same ore minerals occur in a shattered and brecciated portion of the intrusion and in the surrounding Cretaceous shales. Other lode deposits occur on Gibson Hill, Humbug Hill, and Mineral Hill.